In the video I have played it slowly twice just as a melody to start with. I then play it at the proper tempo with bass notes plus strumming on the open strings. The riff itself is quite tricky as you need to keep the slide moving quite quickly ( and accurately ) - angle the slide for all the top string notes and flatten it to get the one note on the 3rd string 5th fret. The really tricky bit however is to get the bass note + chord strum going and then play the riff over the top. What you need to do is practice the riff on its own first until you're able to play it almost automatically and then practice the bass note + chord rhythm on its own. To play this I use my R/H thumb to get bass notes on the beat and my index finger to strum the chord on the off beats. You then need to get the rhythm part going strongly before trying to add the slide riff — all you can really do is keep trying to add the riff without stopping the rhythm and sooner or later it will 'click'. I would suggest you try and get a copy of Bukka White playing this tune to hear the riff in context. 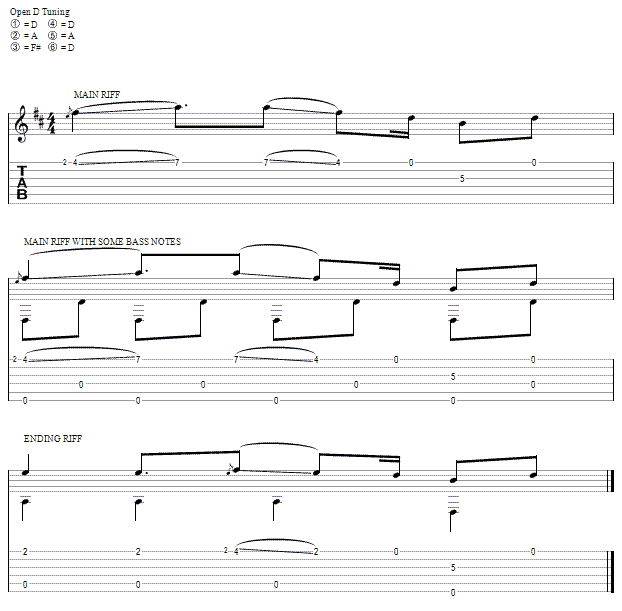 The song has a loose 12 bar structure with this riff plus a few variations interspersed between the vocals.